Hailstorms can cause damage to windows, roofs, and the siding of a house. 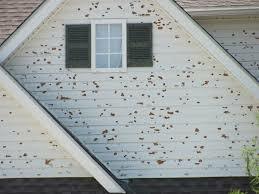 In fact, hail causes more than $1.6 billion in roofing damage per year. However, there are some steps that a homeowner can take to prevent major damage from occurring due to hail. The roof is a home’s first defense. High winds, hail, and exposure to extreme temperatures can take a toll on a roof. Routine inspections on the roof should be conducted. At least one in the spring and one in the fall to insure the roof is in good condition. If a homeowner must replace their roof they should invest in impact resistant materials in either class 3 or 4. Asphalt shingles are commonly used, however, metal, tile, or slate roofing materials could be used as a long-lasting option. Windows are vulnerable to hail due to being made of glass. The most common way to protect windows is by using shutters. There are permanent options that roll down or slide over windows and there are temporary panels that can be stored in a garage when not in use. Closing curtains and blinds can also reduce the risk of injury from broken glass and debris if windows do break. If a homeowner needs to replace windows, they should consider buying models that are wind and impact resistant. Most windows will have designations noting that they passed specific tests. To protect a home from hail a homeowner should also look to the area outside of their home. They should trim trees and remove dead branches. This makes it so that there is less that could damage the home from outside. Also, cars should be moved into garages or under carports. Additionally, patio furniture and outdoor equipment should be brought inside if possible. Hailstorms and other severe weather can occur at any moment. A homeowner should take as many precautions a they can to minimize damage to their homes from these storms.